One of my favorite things is making traditions with my family. Every Sunday my kids love to get lots of books and then we all pile in my bed to read them. We are big readers and have bookshelves full of children’s books. Some of our favorites are from Dr. Seuss. My kids love “Green Eggs and Ham,” “The Cat in the Hat,” “There’s a Wocket in my Pocket,” and “Fox in Socks,” just to name a few. Every year we celebrate Dr. Seuss’ birthday on March 2nd. Dr. Seuss has brought so much joy and laughter to my family. His books have been some of the very first books my kids have read by themselves. We love Dr. Seuss and celebrating his birthday has become one of my favorite traditions. For breakfast, we kick the day off with a Cat in the Hat breakfast with a side of green eggs. I make our favorite pancake batter then divide it in half. One half is left plain and the other I color red with food coloring. I put the batter in a gallon or sandwich size bags, then cut a small corner off one side of the bag. This makes it easy to make little circles to stack as the Cat in the Hat’s hat or to draw an outline of his hat and fill it in. My kids look forward to Cat in the Hat pancakes every year. They also love the green eggs from “Green Eggs and Ham.” I also color their milk pink, like the Yink’s pink ink drink from the book “One Fish, Two Fish, Red Fish, Blue Fish.” Just a little food coloring makes breakfast extra fun to eat. During the rest of the day, we have a Dr. Seuss book readathon and read as many of our favorites as we can. 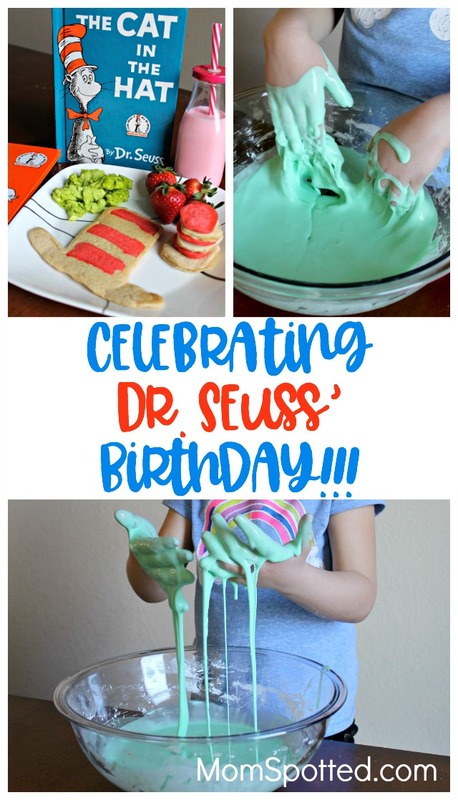 We will watch some of the old school, classic Dr. Seuss movies and also make Oobleck! Have you heard of oobleck before? It is from the Dr. Seuss book called, “Bartholomew and the Oobleck.” Oobleck is so easy to make and is lots of messy fun. 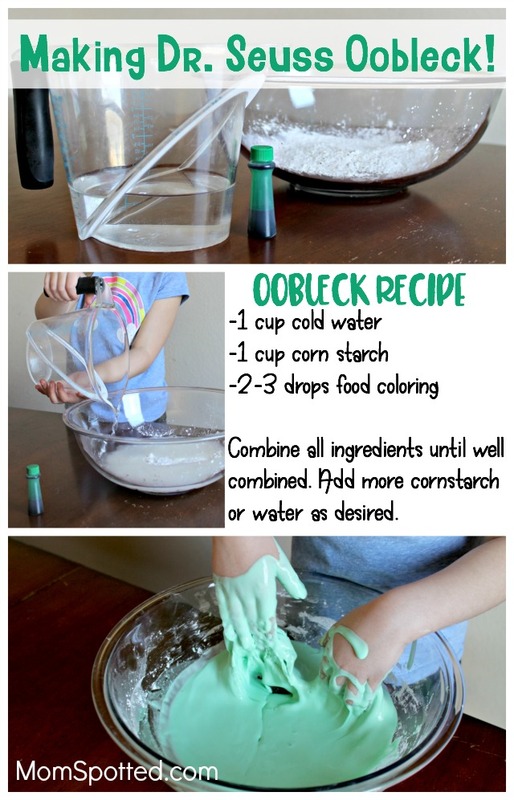 To make oobleck you just need 1 cup of cornstarch, 1 cup of cold water, and a few drops of food coloring. It turns it into a really neat slime mixture. You can’t really tell if it’s a solid or a liquid? We talk about what Oobleck feels like, what it looks like, and what it smells like. 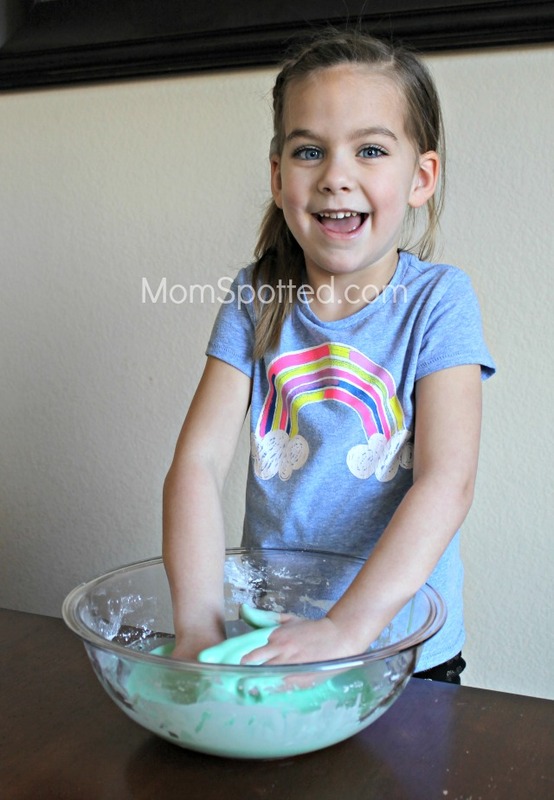 It is such a great sensory activity, science experiment and just fun to play with. It is pretty messy but easy to clean up. It quickly washes off with a little water and dish soap. My kids would sit and play with Oobleck forever. It is so fun making silly little traditions and fun memories with my kids. I am so grateful for Dr. Seuss and how he has helped my kids love to read! I grew up on Dr. Seuss and now it is so fun to share all of his books with my little family. Remember Dr. Seuss’ birthday on March 2nd to make some new traditions with your family. 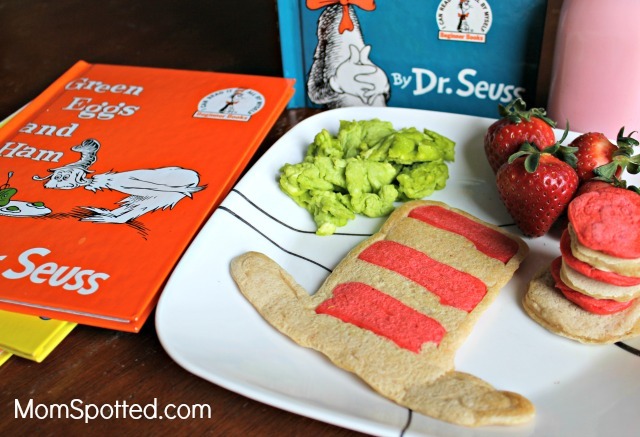 Do you celebrate Dr. Seuss’ birthday with your family? Do you have a favorite Dr. Seuss book? That’s such a great idea to celebrate Dr Seuss’s birthday. I feel like every kid grew up learning how to read from The Cat in the Hat. He deserves his own holiday! that is so cute,,i like it all but the slime,,that looks so messy,,how hard was that to clean up? Cute ideas! I love Dr. Seuss!